Great kit for those that are not yet ready for lipo. This pair of 8 cell 5000mah packs will make your new HPI Super 5SC Flux scream and will fit with no modifications required. Plus, when you decide to upgrade to lipo you will already have the right charger for doing so without having to upgrade that too. This charger balances your pack while it's charging. Of course, the AC/DC part means that you can charge directly from an AC wall supply or from a 12V DC battery/power supply. Clear and easy to read LCD screen with warnings for common setup errors. 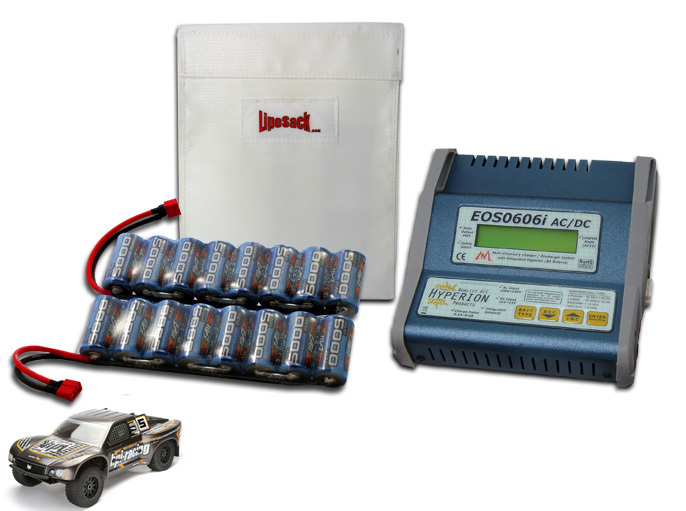 Use this product while charging, storing or transporting any battery pack. The use of a Lipo Sack does not guarantee protection of surrounding surfaces. It is simply intended to mitigate the effects of a battery failure during charging or after a crash. MaxAmps takes no responsiblilty for effectiveness of the lipo sack. Never charge unattended. Always keep your lipo packs in a fireproof container in addition to the lipo sack.